What makes for the perfect rimfire racegun? These are some of the best competition pistols, typically custom-made to offer the best in speed, reliability and accuracy. Unfortunately, a custom racegun is often out of reach for many competition shooters, with price tags reaching into the thousands and beyond. At TANDEMKROSS we believe that participating- and succeeding- in the shooting sports doesn’t have to mean emptying your wallet. With a few key performance upgrades that can be easily installed, you can build your own custom racegun from a Ruger 22/45 or Ruger 22/45 Lite. With our tips below, you'll save money, learn more about your firearm and transform your 22/45 from a pistol that’s great for a day at the range to a competition-ready racegun. Get #TANDEMIZED! How can I upgrade my 22/45 trigger? When building a racegun for rimfire competitions, the trigger of the firearm is critical to give the shooter as much control as possible. 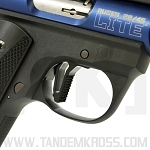 A standard 22/45 trigger features a traditional curved shape, limiting the user's ability to perfect their trigger pull and reducing the gun's speed and accuracy. 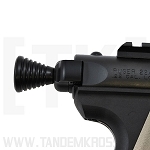 The TANDEMKROSS "Victory" Trigger for the Ruger 22/45 features a flat face (textured or smooth) that allows the shooter to pull straight back and immediately tell if they are pulling too far to the left or the right. This trigger upgrade for the 22/45 also allows the user to put their finger lower on the trigger, increasing leverage and allowing lower trigger pull weights. Fine adjustment screws allow the user to further adjust pre- and post-travel for the ultimate competition trigger. The result? Repeatable, identical, short trigger pulls every time. Do I need an after-market extractor? The factory-provided extractor in a Ruger 22/45 can chip or wear down over time. Once chipped it will fail to properly grab and eject spent casings, causing a jam or "stove-pipe" malfunction that could seriously impact performance in competition. This problem is often difficult to diagnose by the untrained eye. Installing an after-market extractor is a simple fix that improves your firearm's speed and reliability. 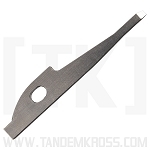 TANDEMKROSS’s “Eagle’s Talon” Extractor for the Ruger 22/45 features an improved sharp “hook” design. It is precision CNC-machined from a hardened tool steel to minimize premature failure like chipping or wear. This allows it to maintain its sharp point, that is necessary to grab and secure each round until ejection, much longer than a stock part. Why use an extended magazine release for the 22/45? Many rimfire competition shooters struggle to use the factory-installed magazine release button on the Ruger 22/45. It's very short. For smaller handed users, it might entail turning the firearm in an unsafe direction to reach the button. If you're using a thicker after-market grip to boost control of the firearm, reaching the magazine release can be nearly impossible and can hinder a competitor's ability to make fast magazine changes. 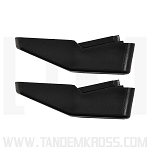 The TANDEMKROSS extended magazine release provides a wider button face and doubles the height of the original button, making it easier to reach the button for smaller handed shooters or when using an improved grip for competition. Ultimately this results in boosting the reliability of quick magazine changes while ensuring firearm safety. Should I replace my Loaded Chamber Indicator (LCI)? 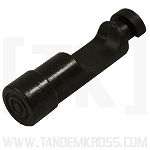 LCIs were added to the MKIII 22/45 to allow users to see when a round is chambered from an external perspective. 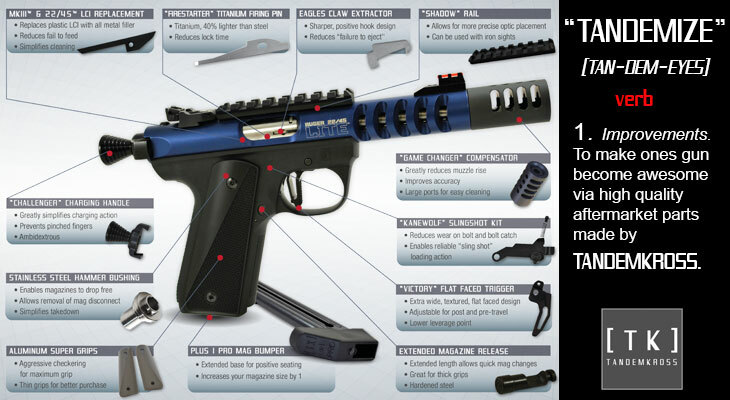 However the LCI on the Ruger 22/45 can cause operational issues. To function properly, the plastic design of the LCI physically rubs against the round as it gets chambered. Once dirty it can create drag and can interfere with the chambering action. This often results in mis-feeding until the firearm is cleaned. Installing an LCI replacement is an easy fix to ensure high performance of your firearm. 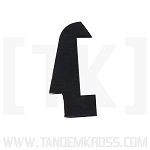 The TANDEMKROSS LCI Replacement Insert is made from high-quality steel, greatly simplifies cleaning and improves the aesthetics of the gun. Should I install an extended magazine bumper? The factory-installed Ruger 22/45 magazine base pad sits flush to the bottom of the firearm, which can make it a challenge to quickly and positively seat the magazine. A magazine that is not seated properly can cause failure to feed issues and even cause the magazine to drop out of the gun when attempting to fire. This can mean the difference between a personal best and a personal worst in competition. 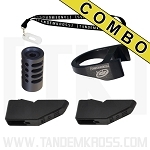 The TANDEMKROSS Plus 1 PRO Magazine Bumper provides extra material to “bump” magazines into a locked position every time. The Plus 1 bumpers also enable factory magazines to load one extra round and include an optional Spring Assist for even faster magazine ejection during competition. Should I upgrade my firing pin when building a racegun? Updating your firing pin is a simple upgrade that can lead to more accurate shooting. A lighter weight firing pin, for example, can shorten a gun's lock time, or the time it takes the gun to go off after the trigger is pulled. The shorter the lock time, the less likelihood your firearm will move off target after pulling the trigger. 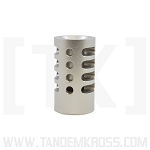 The TANDEMKROSS “Fire Starter” Titanium firing pin is a drop-in replacement for the Ruger factory steel firing pin and is 40% lighter, helping to reduce lock time. 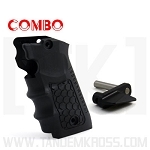 What are the benefits of a compensator? While the Ruger 22/45 is an accurate pistol on its own, reducing muzzle rise when shooting is a must to turn this rimfire pistol into a true racegun. Muzzle rise is caused by the expulsion of expanding gases that follow the bullet as it leaves the muzzle of the gun. A compensator works by venting these gases across a broader area, countering the vertical movement of the muzzle. This is essential when firing multiple shots in succession while transitioning targets. A good muzzle brake offers steadier, more accurate follow on shots. 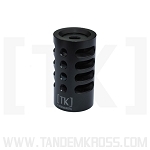 The TANDEMKROSS “Game Changer” Compensator was designed by a physicist, and features vents along the top and at 45-degree angles along the side. This pattern of cuts gives the shooter just the right amount of offset for the .22LR cartridge to speed along their targets without having to drastically re-adjust after each shot. Should I consider a bolt release plate slingshot modification? Like most guns the MKIII 22/45 features a bolt latch system that holds the bolt open after the last shot is fired. This indicates to the shooter that the magazine is empty. However unlike most modern firearms, shooters cannot pull the bolt back and release to chamber a new round from a fresh magazine. This is called "sling shot" action. Instead, the user must reach up and manually push the slide release lever to chamber the first round. This manual action can be nearly impossible for youth shooters or shooters with small hands, and adds an unnecessary step when recharging a competition pistol. Even worse, it can cause wear on the bolt release or bolt face. 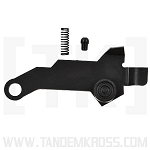 The “KaneWolf” bolt release plate from TANDEMKROSS allows the shooter to use “sling shot” action in the 22/45. This boosts the ease and speed of recharging your Ruger racegun without unnecessary wear to your bolt face or bolt release plate. Do I need a charging handle for my Ruger 22/45? It’s not uncommon to experience painful pinched fingers when charging your Ruger 22/45, thanks to the short bolt ears of the MKIII. Youth shooters, senior shooters and shooters with smaller hands also struggle to pull the bolt back quickly and consistently. The small grip of the bolt ears make it challenging to over come the hammer spring and recharge the gun after a magazine change or to clear a jam. 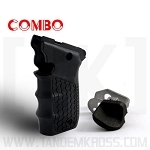 “The Challenger” Charging Handle from TANDEMKROSS is a simple way to overcome these challenges. The unique cone-shaped design of “The Challenger” allows the gun to be holstered without digging into the user's side, and can be easily utilized by right-handed and left-handed shooters. Should I remove my 22/45's magazine disconnect? The Ruger 22/45 includes a magazine disconnect that does not allow the gun to fire unless the magazine is properly seated. Unfortunately, the magazine disconnect also often stops the magazine from dropping free when the magazine release button is pressed, slowing down magazine changes during competition. 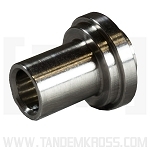 The TANDEMKROSS Steel Hammer Bushing is a simple replacement for the Ruger factory bushing that simplifies magazine changes, makes cleaning easier and allows the gun to fire without the magazine for tactical competition.